What you are about to read may easily be mistaken for a discussion between third graders at recess. Do not be fooled. It is actually a discussion, practically verbatim, between my ultra mature husband and the ever-adult me. Again, please don't freak out. As long as we've been together we've played a game in which I throw out hypothetical names for our very hypothetical children (usually a hypothetical daughter because girls are more fun to name anyway... hypothetically), and Jon rejcts each and every prospect for various, silly reasons. Not making any sense? Read on. "I know. Lydia is a disgusting name." "One letter away from 'Harlot'." "Actually, it's three letters away from Harlot." "Harlot doesn't end with T-T-E."
"The name of the girl I had a crush on in 2nd grade." "She wasn't a tramp in second grade, was she?" "Okay then. What about Mariska?" "I don't even understand what you're saying." "Why does that sound familiar?" "Oh, it's because I was talking to a woman today named Danielle ." "So you like the name?" "No, seriously. 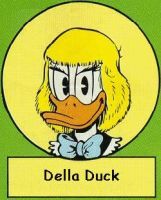 What about Della?" "Only if I get to pick her middle name." "Fine. You wouldn't brand our hypothetical daughter with something ridiculous." "Not a good name for a girl." "No, I'm talking to you." "You can't simply veto everything I put out there." "I can if I think it's dumb." "You don't think all of these names are dumb." "Audrey, think about it. If her name was Della and we were attempting to get her dressed in the morning, there's a chance that you might call out to me, 'Honey, what should Della- wear ?..." Not that this is a reason I married him, this complete compartmentalization of all things random. Who breaks words down into their elements and considers them syllabically? No one. No one except my sweet husband. Who also, I might add, mentioned Della- cate and Della- gate as reasons to reject my favorite name. Oh, and Della- catessan . Anyway, we laughed a lot over this episode of the Name Game. And it was even funnier when we heard that Nicholas Cage named his brand new son Kalel (Superman's name on the planet Krypton... Jeremy, aren't you proud?). Apparently I'm not the worst at this sport.